The leadership at the Council for Economic Opportunities in Greater Cleveland (CEOGC) will present its breakthrough Friendships through Reading program, which is a collaboration with the City of Cleveland Police Department, at National Head Start Association’s 2017 Fall Leadership Institute September 25-28, in Arlington, Virginia. Dr. Jacklyn Chisholm, CEOGC president and CEO, and Dr. Thea Wilson, vice president for families and children, will be presenting how they collaborated with Cleveland Police Chief Calvin Williams to create a program that can excite Head Start students to want to learn to read, while helping them feel safe with the police officers who serve their communities. “It’s definitely about reading, but it’s also about police-community relations with our own folks,” said Chief Williams in a news release last fall announcing the program’s start. The Friendship through Reading program is intended to assist the Cleveland Police Department as it strives to build a stronger, more positive relationship with the children and families in the community through interaction and open communication. The idea was formed when the CEOGC had invited Chief Williams to read to students the first day of school in 2016 at one of its Head Start location. He read two books: If You Take a Mouse to School and his personal pick Llama Llama Red Pajama. The students were captivated by his reading and asked him questions about being a police officer. A four-year-old asked the Chief his name. “My name is Calvin, what’s yours?” The special connection was instant and inspired the start of a program. 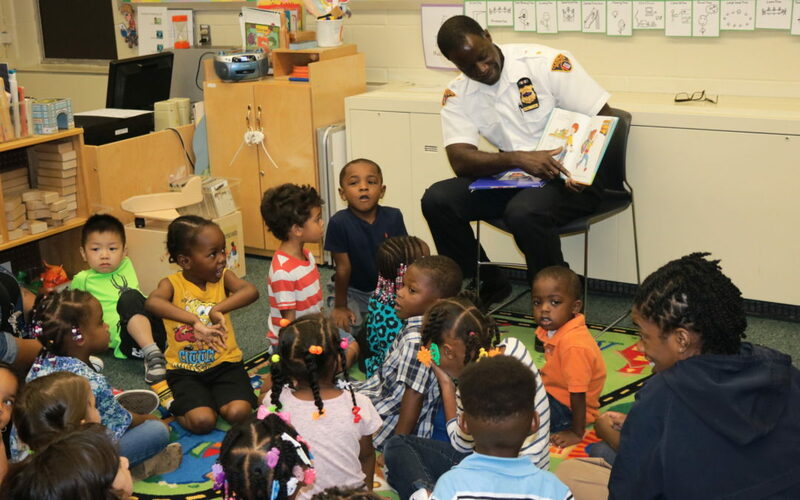 Shortly thereafter, rank and file Cleveland police officers began visiting all CEOGC Head Start locations to read the popular children’s books or their own favorite childhood stories. They also chose titles from the CEOGC’s Head Start Top 20 children’s books selected by Dr. Thea Wilson. About CEOGC: The Council for Economic Opportunities in Greater Cleveland is a nonprofit organization and Ohio’s largest Community Action Agency that operates programs and services dedicated to transforming the lives of residents. The Council delivers education, personal and professional development programs and support services to residents of Cuyahoga County. Programs include Early Head Start (birth to three) Head Start (three – five years of age); individual assessments for classes and coaching sessions on topics including parenting, anger management and life skills; and professional development: job readiness, customer service training and job placement. The Council also delivers the Home Energy Assistance Program (HEAP). For more information visit www.ceogc.org.